There was no way I was camping out for the 10AM kick-off panel with J.J. Abrams and Kathleen Kennedy. After a turbulent flight and a full day at Disneyland the previous day, I was sleeping in a bed. 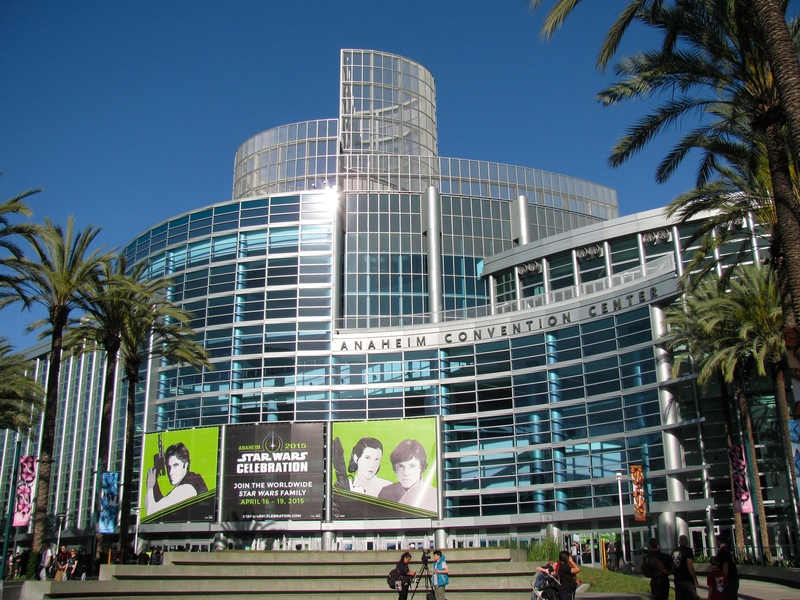 I would get there when I got there and see if I get into one of the five rooms showing the panel. I got there 8:30AM and shortly after got a bracelet for the Behind the Scene Stage room. I just missed the cut off for the Digital Stage Ballroom. They didn’t let us into the room till 5 after 10 and by then panel had already began. I am sure by now many have either seen the panel online or read about the highlights. J.J., Kathleen, John, Daisy and Oscar were being really cryptic about the story and their roles. I was surprised to see the BB-88 was functional in real life. Does the head stay on with magnets? 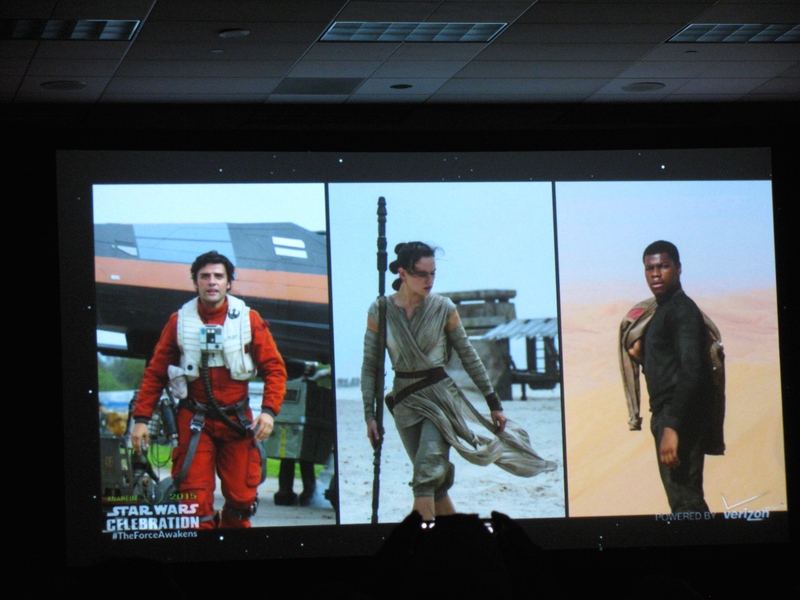 Oscar Isaac said his character, Poe Dameron, is the best pilot in the galaxy. What about Han Solo? He does look hot in this photo though. They are all really good looking people. So after the exciting trailer I went downstairs to the Exhibit Hall. Besides opening the doors later than 11AM, it was insanely crowed and overwhelming. I really did not know where to go first. After taking a look at the crazy Autographing queues I went to Her Universe instead. It was a mad house because Ashley was there talking to fans and taking photos with them. There needed to be some sort of security organization. There was no organized queue and some woman in Sith Twi’lek cosplay cut me in line to ask a question. After she left I squeezed in to make my purchase. I bought: the “Star Wars” written-with-Lightsabers-that-glows-in-the-dark T-shirt, and matching skirt; the AT-AT DaVinci style; and the Salacious Crumb’s Bake Shop shirt. I wish I had known about the Salacious Crumbs cupcakes being sold on the other side of the Her Universe booth. Buy the cupcake of the day and get $5 off the t-shirt. I found out about that on day 2. Next was the Celebration Store debacle. I was on the queue TO GET INTO the store for about 30 minutes. It wrapped around the store and it did not move, except when people were leaving the line. I decided to try first thing the next morning. So I went back to Autographing. I bought my Saturday photo op ticket for the Geonosis Jedi – Amy Allen (Aayla Secura) and Orli Shoshan (Shaak Ti). Then I waited on the autograph line. That took about an hour. I bought tickets for Ashely, Amy Allen, and Orli Shoshan. I was holding off on Mark and Carrie. They were expensive and I do already have their autographs on other photos taken at NYCC. As I was making my way to the Untold Clone Wars panel I ran into Ashley and David Eckstein. She’s so sweet. She asked about my sister and I said she’s well but could not make it to Celebration. I asked about the Vader/Ahsoka shirt that I did not see at the Her Universe booth. She said it is available on the web site but they decided to bring the new “Ahsoka Lives” shirt to Celebration instead for #AhsokaLives Day. After a quick photo I said I’d see her later at her autograph table. 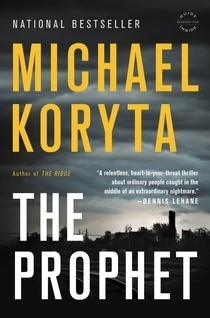 A new thriller from international bestseller Michael Koryta: the killer of a teenage girl terrorizes a small town and reopens decades-old wounds. Adam Austin hasn’t spoken to his brother in years. When they were teenagers, their sister was abducted and murdered, and their devastated family never recovered. Now Adam keeps to himself, scraping by as a bail bondsman, working so close to the town’s criminal fringes that he sometimes seems a part of them. Kent Austin is the beloved coach of the local high school football team, a religious man and hero in the community. After years of near misses, Kent’s team has a shot at the state championship, a welcome point of pride in a town that has had its share of hardships. Just before playoffs begin, the town and the team are thrown into shock when horrifically, impossibly, another teenage girl is found murdered. As details emerge that connect the crime to the Austin brothers, the two must confront their buried rage and grief-and unite to stop a killer. The Prophet was a wonderfully written story about grief, family ties, and a suspenseful mystery. I became emotionally invested in each of the brothers’ lives. They were developed in a well rounded way that I could understand each’s point of view; Adam’s guilt, living in the past, and wanting revenge as well as Kent’s decision to forgive, like a good Christian, and learning that life goes on. What was also identifiable was that though Adam and Kent were estranged, in the end they would still do anything to protect each other. That end sure had me at the edge of my seat and shouting out at the characters, then ultimately I cried at the bitter-sweet outcome. There were some questions that were not answered or not fully detailed, but it’s acceptable because this was the brothers’ story. Not the police, or the FBI, or the killer’s. It kept it simple and more character driven. As someone who hates football unless it’s a Friends Thanksgiving episode, or movie and TV series Friday Night Lights, I liked how the football games factored in. (Which makes sense because when they handed this out at Book Con last year they described it as Friday Night Lights meets In Cold Blood.) I didn’t understand the terminology, because I just can’t grasp the rules of the game, but I was rooting for the Cardinals and for their distraught star player. If you stumped about what you should read next, this would be my recommendation. 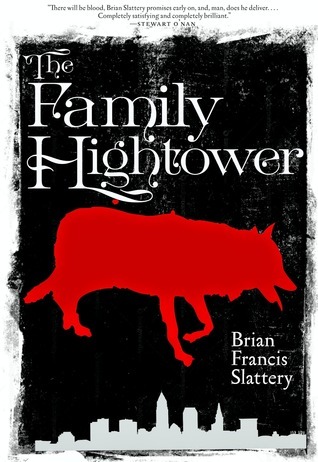 In 1968 two boys are born into a large family, both named for their grandfather, Peter Henry Hightower. One boy—Peter—grows up in Africa and ends up a journalist in Granada. The other—Petey—becomes a minor criminal, first in Cleveland and then in Kiev. In 1995, Petey runs afoul of his associates and disappears. But the criminals, bent on revenge, track down the wrong cousin, and the Peter in Granada finds himself on the run. He bounces from one family member to the next, piecing together his cousin’s involvement in international crime while learning the truth about his family’s complicated history. Along the way the original Peter Henry Hightower’s story is revealed, until it catches up with that of his children, revealing how Peter and Petey have been living in their grandfather’s shadow all along. The novel takes a look at capitalism and organized crime in the 20th century, the legend of the self-made man, and what money can do to people. Like Jeffrey Eugenides’ Middlesex, The Family Hightower stretches across both generations and continents, bearing the weight of family secrets and the inevitable personal toll they take on loved ones despite our best intentions. First I must note that the copy I read was an Advanced Uncorrected Proof that I received last year at Book Con. I’m reading the books I received then before I attend this year’s Book Con at the end of the month. Part one of the book was really thrilling and mysterious. I quickly found myself rooting for the good Peter Henry Hightower cousin. Part two, did give great insight into the family history but it also slowed down the story for me. I had put the book down for more than a week before I picked it up again and powered through to finish. Which then made part three, that was back in the present day of part one, feel a bit anti-climatic. I thought there would be more of a suspenseful chase but the set up events made everything work out smoothly. Still, the characters are well developed and evoke emotion from the reader. Like I said, I rooted for (the good) Peter, I even rooted for Sylvie, thought Petey was a naive, selfish, idiot, felt so bad for Madalina and her parents. The writing style is very descriptive as the author speaks directly to the reader. The narration at times is more told then shown. Often the dialogue is not in quotes but just a reference in italics. Sometimes the sentence are rambling and go off on tangents, or skip between past, present and future. However, it all comes together and makes sense in the end. There is a lot of well researched history; history of Cleveland, African nations, Ukraine and the Soviet Union, . One historic moment I especially liked was the Sugar Ray Robinson-Jimmy Doyle fight because of the way it symbolically tied in with the threat old PHH gets. Overall it was a good historical fiction like story of a dysfunctional family and the disgusting life of organized crime.